Bio Notes: Thomas Henry Watson was born in Glasgow on 1 November 1839, the son of London architect John Burges Watson, who was Surveyor to the Pentonville Estate; how he came to be born in Glasgow is unclear. He received his training in his father's office and studied at the Royal Academy Schools, winning three silver medals in 1860, a gold medal in 1861 and a travelling studentship in 1863. He was admitted ARIBA on 17 February 1862, his proposers being T Bury, T H Wyatt and F J Francis, and two years later he won the Soane Medallion. He worked with Robert Hesketh and became District Surveyor to St George's, Hanover Square (North). He was President of the Architectural Association in 1870-71, and was elevated to FRIBA on 5 November 1877, proposed by Wyatt, R Hesketh and T L Donaldson. From 1901 to 1907 he worked in partnership with his son Arthur Maryon Watson (born 1871 or 1872). 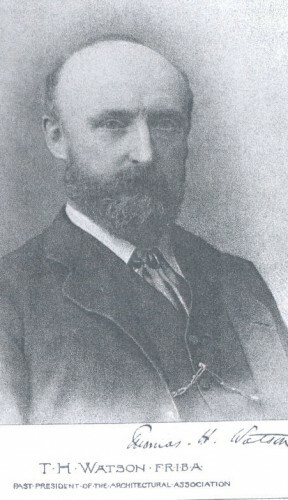 Thomas Henry Watson died on 13 January 1913 at 5 Akenside Road, Hampstead.